Fourth graders from elementary schools on Mount Desert Island and in Trenton visited the MDI Biological Laboratory in Bar Harbor during the week of Nov. 26 for an introduction to biology that involved learning how to use a microscope; making observations about C.elegans, a tiny nematode worm that is a popular animal model in scientific research; and logging, analyzing and charting their data. Here, Charli Osier, 9 (left), and Landun Robichaud, 10, from Trenton Elementary School count the number of worms on an agar plate under the supervision of Elisabeth Marnik, Ph.D., a post-doctoral researcher at the MDI Biological Laboratory. “This is an amazing opportunity for them,” said their teacher, Diane Clark. 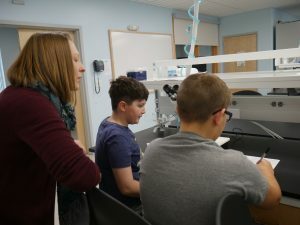 “They love the hands-on experience and the opportunity to work with powerful microscopes that aren’t available at our school.” She added: “They are totally on task.” “It’s very cool,” agreed Robichaud. “I can even see the guts of the worm!” The course was designed and led by Marnik with the assistance of Amber Wolf, the institution’s education projects and training lab coordinator. The MDI Biological Laboratory-sponsored program involved about 100 students from five elementary schools.